Archer Lodge Middle FBLA and FFA club members, faculty, and performers sit together after a successful show. 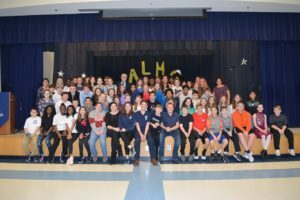 Archer Lodge Middle’s Future Business Leaders of America club (FBLA) and Future Farmers of America Club (FFA) produced their first talent show this school year. 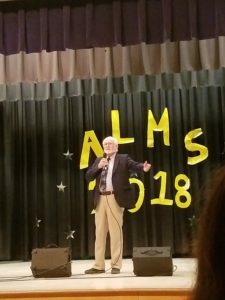 The event showcased the talents of 6th, 7th, and 8th grade students along with staff members. 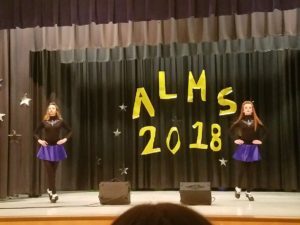 The performers had a range of talent from Irish Dance, group and individual dance, singing, playing piano/keyboard, ukulele or trumpet, to impersonations of Michael Jackson as well as some who even choreographed their own dance numbers. There was also teacher and staff talent including Don Johnston, Gina White, and Allison Batten. Teacher assistant Don Johnston sings “I Believe” to much applause. FFA Vice President Tyler Pinkowski and FBLA President Preston Styons emceed the evening with their own jokes and improvisation that kept the audience laughing. Students from both groups worked to create and produce the show. They created the designs for the sponsor posters, stage designs, program, and posters to advertise the event. Students from both groups also worked as backstage crew, concession workers, admissions, greeters, set up, and break down. Also, with the help of Media Specialist Michele Byrd, worked the sound system for the evening’s music. A crowd of about 200 parents, students, and staff attended the event and helped raise $600 for students to use for future projects.